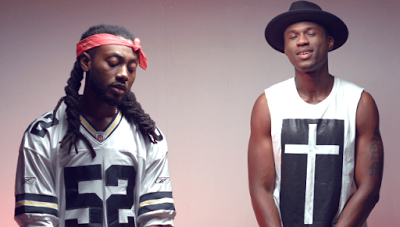 Pappy Kojo, Joey B – A Group Or Just Good Friends? Mention the Top 10 most relevant artistes in Ghana presently, and clearly, the average music fan would not blink to add the names of rappers, Joey B and Pappy Kojo. For the past year or more, they have almost become two of the ‘hottest’ brands in Gh. Hip hop and Ghanaian music in general – with a plethora of hit songs and a deluge of high-profile shows. In this period of career flourish for the two, RazzOnline.com have realized that what has become significant is the sight of them on almost every music event poster, the mention of their names in almost every music event commercial and the performance of the two together on almost every music stage. The strong friendship of the two is telling and the story of Joey B influencing Pappy Kojo into mainstream music has been told incessantly. What is confusing for most fans is whether the two are a group, considering the several hit songs together, the enviable camaraderie that exists between and the penchant for event organizers to want to always put them on the bill together. With ‘Wave’, ‘Realer No’ and several other collaborative works plus their individual hit tracks, the two are flying high, sitting atop the music food chain. Officially, Pappy and Joey are signed to different labels and have different management teams, and considering the contractual fracas that characterizes performance fees with event organizers, the ability of the two to headline major shows without any shred of glitch – is quite impressive. Fans have raised several questions on the emergence and progression of this Joey B – Pappy Kojo alliance and how well it is influencing the music industry. Could they actually be a group, albeit without any official name or their hit songs together and friendship is what surges them on? How are event organizers able to deal with them? As individual acts, through their respective a management or as a group, contracted only to come perform their collaborative songs, with the knowledge that they will still perform their individual hits upon nudges from the fans. Should artistes necessarily form a group before they can work together in such an impressive without any scuffle, be in difference in creative ideas and squabbles over money or disagreements with event organizers? Whatever mechanism these guys are employing, it is working, especially when they are able to get their songs played, attain social media relevance, get the big bucks from the shows and most importantly – are able to attract the endorsement deals.